Banff Trail residents are actively engaged in their community and keeping them informed is our top-priority. 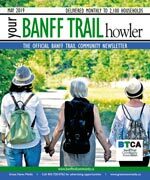 Your Banff Trail is the official community newsletter, and covers community news and is published monthly to keep content current and relevant. Delivered to every household, apartment, and business, every resident is acquainted with the community’s most important information. Banff Trail is home to one of the city’s oldest community associations, which has been in existence since the 1950s. During this time the community association has initiated a number of programs and remains very active today. The community association spearheaded the creation of a Community Garden attracting the involvement of a wide variety of community members. Each year the community also hosts a popular Stampede Event as well as several pancake breakfasts. In the City of Calgary’s 2012 municipal census, Banff Trail had a population of 3,837 living in 1,950 dwellings, a 7.1% increase from its 2011 population of 3,582. With a land area of 1.5 km2 (0.58 sq mi), it had a population density of 2,560/km2 (6,630/sq mi) in 2012. Residents in this community had a median household income of $49,996 in 2000, and there were 25.8% low income residents living in the neighborhood. As of 2000, 15.3% of the residents were immigrants. A proportion of 35.8% of the buildings were condominiums or apartments, and 46.4% of the housing was used for renting. For more detailed info visit the City of Calgary community profiles.